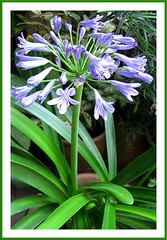 A fascinating bluish-purple variety of Agapanthus joined our garden family in early January this year. Just found out that this beauty loves to be pot bound. Aargh…we’ve already planted it into a large terracotta pot, too late now to be repotting to a smaller size, I think! Hope it stays happy! It had a lovely 66 cm (26 ins) tall budding spike then, that blossomed into a large 20-cm (8-in) globular flower head with fabulous blue and purple hues. When lighted by the sun, the trumpet-shaped flowers seemed purplish to lilac, yet wonderfully blue-hued in the filtered shade. And, even more remarkable was an abnormal fusion of two buds to form a single whole flower with 11 petals altogether instead of the usual 6-petaled flower, and bearing double the usual number of stamens. How interesting to see this unique fasciation for the first time ever! Nature is absolutely awesome with its magnificent designs! Click on the left image for an enlarged view to observe the phenomenal beauty, if you’re interested! Surprisingly, just three months later in early April, this same potted Agapanthus plant decided to smile again with a second flowering stem. Plant type: Herbaceous perennial plant that is native to South Africa, spreading from the Western to the Eastern Cape. Light: Full sun to semi-shade, though grows and flowers best in full sun. Moisture: Requires medium water regularly during the growing season, but less once established. Though tolerant of drought and poor soil, it performs better if watered and fed. Soil:Well-drained and moderately fertile soil. Propagation: Propagation by seeds or division of offsets or rhizomes. Plants sown from fertile seeds that will germinate within 4-8 weeks is a slow process with flowering probably in their third to fourth year whereas by division may bloom after the first year or so. Best to allow Agapanthus to be root-bound before dividing the rhizomes (after flowering or early spring) with a sharp knife, being careful that each division has some roots. Then, plant them about 2.5 cm (1 in) deep in individual pots or 45-60 cm (18-24 ins) apart on the ground. Features: Agapanthus, a genus of evergreen or deciduous flowering perennial plants, has 6 species, which consist of many more hybrids or cultivars. 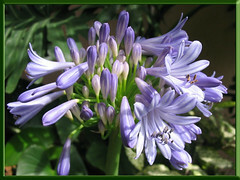 Though a very variable genus, Agapanthus species are broadly similar in appearance. The plants produce dense tufts of rich to deep green or greyish-green, leathery, and strap-like leaves with blunt or pointed tips, varying in length and width that range from 20-80 cm (8-31 ins) long and 2-5 cm (0.75-2 ins) wide. These basal leaves that can be arching or sub-erect and distichously arranged, grow on very short stems that arise from thickened and fleshy rhizomatous roots. It produces erect stems (scapes) that can reach 60-90 cm (2-3 ft) tall, towering over the attractive foliage and bearing showy umbels of tubular or bell-shaped flowers, in varying shades of blue to purple or white. Globular or pendulous flower heads can be small or as large as 20 cm (8 ins) or more, blooming over a long season in the tropics or from late spring to early autumn in frost-free climates, depending on the species. 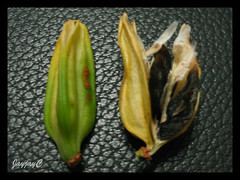 Flowers will eventually develop into seedpods containing winged black seeds. Out of the 6 Agapanthus species, 2 species, namely A. africanus and A. praecox are evergreen, while the remaining 4 species are deciduous, that is A. campanulatus, A. caulescens, A. coddii and A. inapertus, an attractive drooping species. Usage: Agapanthus are popularly grown in garden borders, beds and parks, or raised planters along sidewalks and road dividers, especially the larger species and cultivars. They’ll make excellent container plants for porch or patio due to their compact upright shape and fabulous foliage that are attractive even when not blossoming. The dwarf hybrids will be most ideal for front of the borders, rockeries and pots. 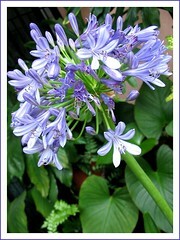 Agapanthus will make excellent cutflowers for vases, floral arrangements and even for bouquets. Agapanthus are known to contain medicinal properties and thus used culturally and medicinally to treat cardiac complaints and other ailments related with fertility, pregnancy and pulmonary illnesses, etc. Read more at Plantzafrica.com, subtitled ‘Cultural uses’, as well as explore the fabulous images and other excellent information contained therein. 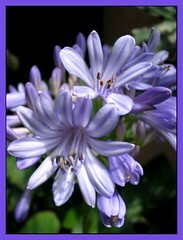 Care: Agapanthus species are easily grown, needing little care as they are hardy plants. Locate them at sunny and warm sites for best growth and flowering. Well-drained soil is essential to prevent yellow leaves which is an indication of water-logged conditions. Water moderately and feed it fortnightly or so with a balanced fertilizer during the growing season. Try not to use overly large containers as they love to be pot bound. Dig up, divide and replant clumps every 4 years or so to rejuvenate and encourage flowering. Remove spent flowers to conserve energy and induce further flowering. Keep them neat by removing old foliage as well. It is least bothered by pests and diseases. For temperate zones: Hardiness – USDA Zone 7 to 11. More information at Botany.com. 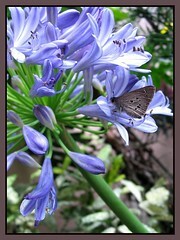 Other interesting fact: Agapanthus is considered a weed of Blue Mountains Bushland. Explore here to be enriched further! 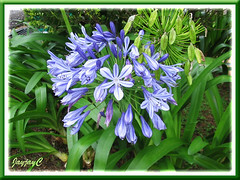 Agapanthus images: View more pics at Broadleigh Gardens. 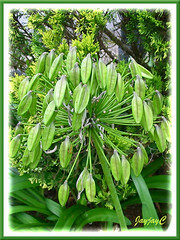 On our recent vacation to Cameron Highlands, we came across unripened seedpods of Agapanthus and captured a couple of shots to share them here. Fascinating to see a flowering spike filled with seedpods instead, a first time for us! Hello, I live in Houston, TX. 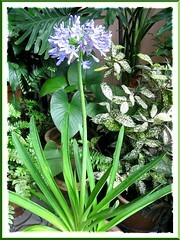 and I planted two Agapanthus plants in April in our backyard garden which gets full sun. It is only June and the flowers have already fallen off? Is this normal? Will they flower again before fall? Do we need to fertilize them every month since they are new? Thank you for this site, I was searching high and low for the past few days, trying to get the name to this beautiful plant. I bought one when I was in Cameron Highlands a couple of weeks back. What drew my attention to this plant is the striking beauty of the flowers, I re-potted it as soon as I got back home and I can tell that it is growing very well and perhaps in a week or two, I will enjoy the beauty of the flowers again. Thank you. Our pleasure, EKLim! 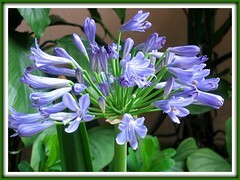 May your Agapanthus delight you with many blooms. I am working at a University nursery in Cape Town, it seems many of the Aggie stock plants we have have developed fasciated growth, absolutely stunning. In an area where they are grown as a very ordinary garden subject – its a treat to see one with such distinct inflorescence!